This color in the photo is true to the actual product. It's a gorgeous comforter. The Chevron Waves Comforter - Supersoft Ocean Depths Teal is 100 percent Microfiber, includes 2 matching shams and machine washable. Constructed of thick 270 GSM inner fill, this comforter's chevron textured design makes creating room decor easy and affordable. This is one of my favorite things I have bought from Overstock. Beautiful color, feels soft against the skin. Just the right amount of thickness for a warm environment but obviously can be paired with something warmer in the winter. If you love turquoise or teal, you can’t go wrong with this. Very soft and comfortable and beautiful in color! Love this comforter. Love the color, comfortable. Size is perfect. Fast shipping. It was darker than I thought it would be but the comforter is still beautiful. Really warm and soft and can go with a lot of decorative pillows. 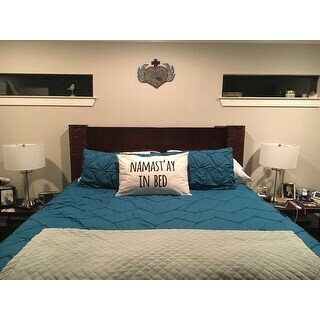 This comforter is the perfect peacock blue... Not too green, not too blue. I love the texture and it is super comfy. Lightweight. It seams slightly oversized and I love how it hangs on my platform bed. This was the ONLY King sized comforter that was long enough for my super high bed. Very soft and super warm! Exactly as pictured. Very soft, good quality. Super soft!! Color is perfect! So soft! Color is true to picture, good quality! I’m very much impressed. "Hello I was looking for this comforter in a king size is it available "
Currently the king size is out of stock.